To celebrate Halloween, Awake NY announced a special themed pop-up at New York-based vintage retailer Procell. 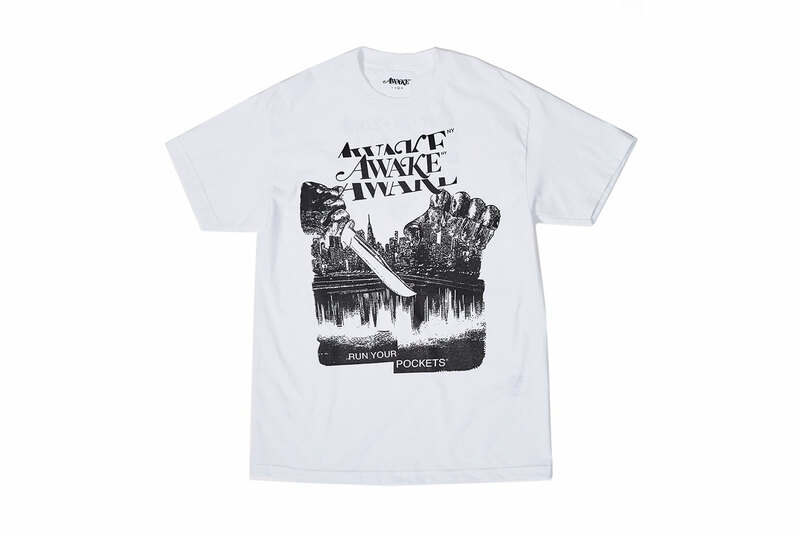 Commemorating the special retail experience, Awake NY and Procell put together a T-shirt centered around the slasher flick sub-genre of horror films that has become synonymous with All Hallows’ Eve celebrations. The chest area of the shirt features a slashed take on Awake’s signature logo and a pair of knife-wielding hands surrounding a skyline of New York captioned with the phrase “RUN YOUR POCKETS.” Finally the rear of the shirt notes the date and time of the pop-up accompanied by a weathered motif of Jason Vorhees‘ hockey mask made famous in the Friday the 13th film series. The limited Awake NY x Procell Halloween T-shirt collab will be available at the pop-up and on the Shopify Frenzy App from October 31-November 2. For more contemporary fashion, cashmerepullover’s latest release advocates affordable art education. With metallic gold lace tips. Featuring appearances by Kamaiyah, Jay Rock, Tyga & Lil Fade, amongst others. A new addition to the Black Series line.